You can check out a a photo by clicking the image above. 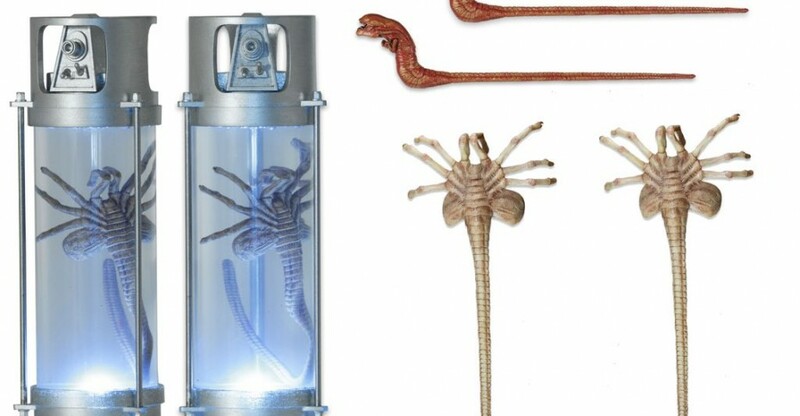 Really like the canister with the facehugger inside. Less of a Queenburster, more of a nymph really. Presumably as part of a creature pack or a similar deal to Queen Attack Bishop with an extra to fill out the box. 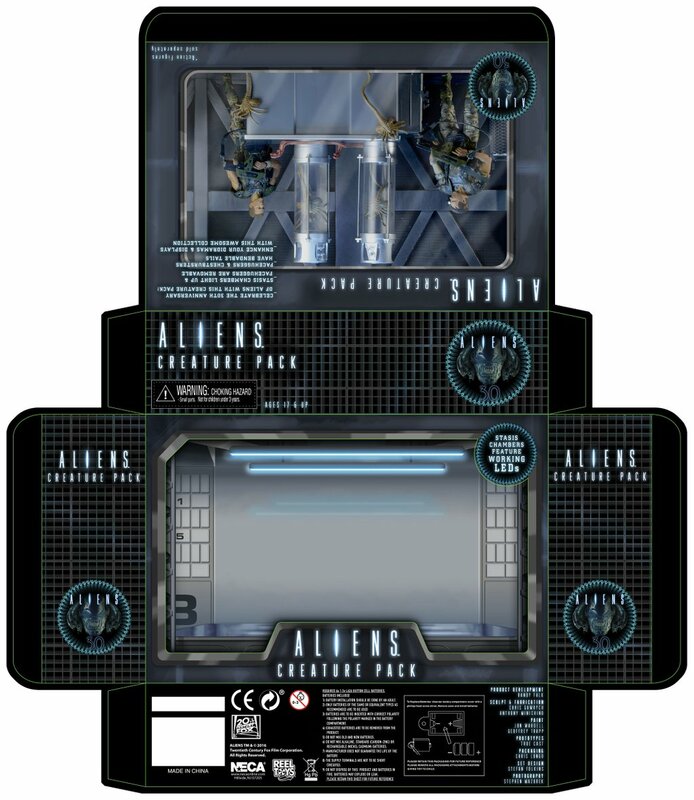 Now split into two packs...One for Aliens and one for Alien 3. Much better idea to do it this way, since most people probably just wanted the Aliens stuff anyway. I've still yet to see the egg pack. It's still in stock on the TRU website and a single pack qualifies for free shipping. I'd have preferred anything else to the two 'huggers since I've got multiple egg packs, but I'll be buying this set anyway. What's the latest on dioramas? I recall talk of an AvP columns set and, I'm not sure of the context, the ship from Predator 2. But that could be anything. I'd love an Aliens lab... or anything, really. Just so I don't have to spend hours making my own! 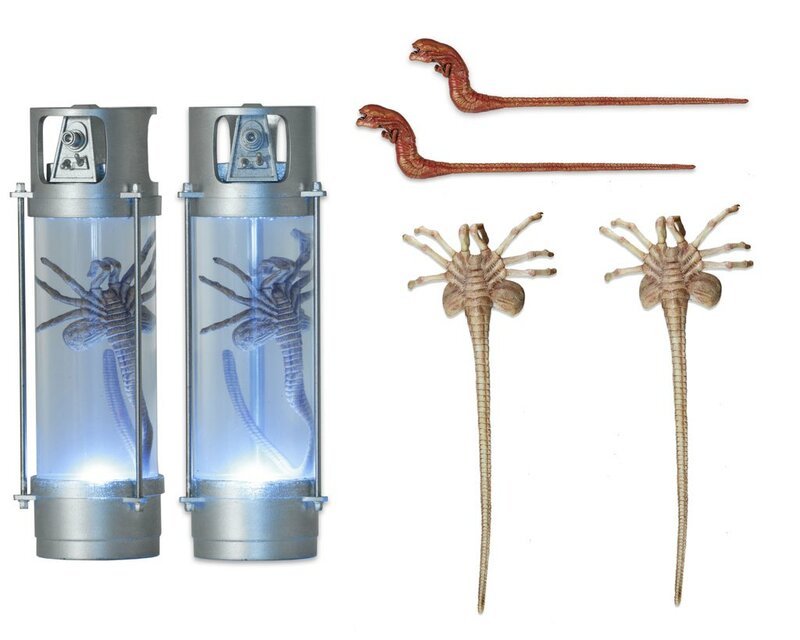 NECA has shot down the idea of more diorama set pieces many times now for many licenses. I think the only one they've continued to notion is maybe a small pillar display for AVP similar to what we see in their shoots but even that's not 100% in the plan. The Predator 2 ship or Aliens lab would be way too big and expensive for too little guaranteed sales. Even the trophy wall set didn't sell that greatly and Freddy's furnace was underwhelming. Diorama sets are a cool idea but way too few consumers actually care enough to make them a worthwhile investment from a production point of view, especially in this scale where even a small set is still quite large. The latest from Randy (and this is only what I recall) is that they're proceeding with the pillar set. I'll certainly snap it up so long as it isn't stupidly priced. I have the trophy wall, it's insanely heavy relative to what it could have gotten away with. It's a similar problem with the Predator Blade Fighter I've got, it's massive! I totally understand their ethos of quality to price ratio, but those two sets alone were incredibly ornate relative to consumer interest. Even generic sets could be something to consider, or at least something collectors outside of their main lines could use - a jungle scene, sewer, rooftop, whatever. I do appreciate it all requires quite a monetary leap in the dark. You wonder what they gad those glass tanks for in the colony they thought they were going to a dead planet to colonize it. It is possible that some of the highest up people maybe knew or had reason to suspect there was life and they deliberately kept the colonists in the dark. It is also possible that these containment units were a mandatory precaution despite what their reports told them if they should find alien life so they could contain and study it. 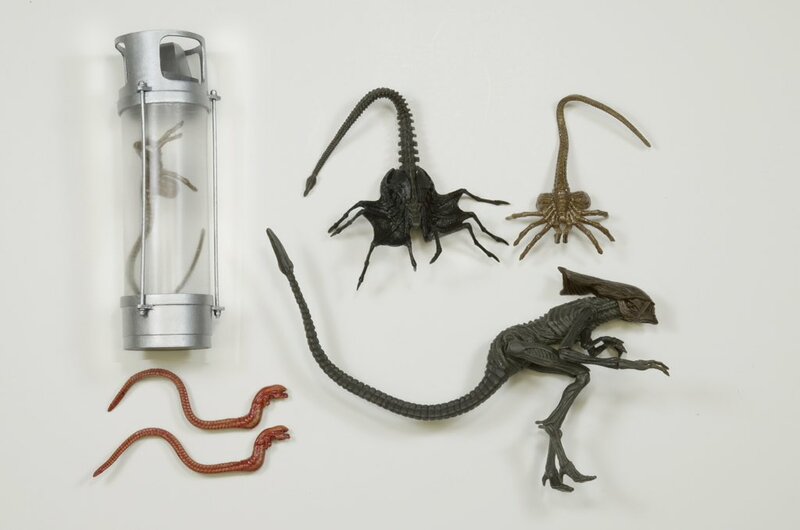 It would be cool if NECA provided 3D printer files for diorama stuff. Though I suppose fans could get to work on that. That's the only thing I could think sine they didn't have replicators to actually design and make a custom container. Even though they are very neat I can't forget the Space Balls scene in the diner when I see the chestburster since in the movies they weren't on screen very often. LOVE the LED light-up stasis chambers! LOVE 'em! Thanks, NECA! Nice, but where is the Vasquez reveal? Saving the best for last? Hopefully, unless they reveal Vasquez and then end the day with something really crazy.